The Nassau Suffolk Water Commissioners’ Association (NSWCA), recently held a Special Information Session. 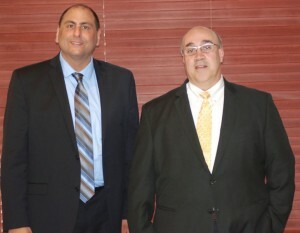 Guest speakers Joseph C. Ferreira and Thomas J. Ruggiero, Partners at Hauppauge-based AVZ & Co. P.C. Certified Public Accountants, addressed the Commissioners on the topic of “New York State Comptroller Audits.” Albertson Water District Commissioners Howard Abbondondelo, Richard Ockovic and Kenneth Vey hosted the session. Mr. Ferreira (Smithtown, NY) is a Hofstra graduate and a member of the American Institute of CPAs (AICPA), the NYS Society of CPAs (NYSSCPA) and past-chairperson of the Real Estate/Construction Committee for the Suffolk Chapter of NYSSCPA. Mr. Ruggiero (Port Jefferson Station, NY), a Dowling College graduate, is a member of the American Institute of CPAs (AICPA), the NYS Society of CPAs (NYSSCPA), The NYS Government Finance Officers’ Association (NYSGFOA), the NYS Association of School Business Officials (NYSSASBO), the NYS Conference of Mayors (NYCOM) and the NYS American Council of Engineering Companies of New York (ACECNY).